Which comes first? The chicken of knowledge or the egg of thinking? Over the past few years I have been advocating the view that thinking is a very shallow experience without knowledge. It seems self-evident that you can’t think about something you don’t yet know. Give it a go… tricky, isn’t it? But not only that, the more you know the better you can think about it. If I ask you to think about, say quantum physics, unless you know something about it you’ll probably be reduced to “What’s quantum physics?” or repeating quantum physics, quantum physics over and over again. More likely though, you probably won’t bother to think at all. I knew almost nothing about quantum physics until reading Jim Al-Khalili’s Quantum: A Guide For The Perplexed. I found it fascinating and am currently reading Brian Green’s marvellous, The Elegant Universe . The more I find out, the more interesting my thoughts become. I think I know what he means – that what we discover only has meaning as we apply our cognitive faculties to it – but it sounds an awful lot like simply thinking hard enough about, well, nothing, will produce some sort of insight a la Buddha. And it won’t. We have to have something to think about. And she’s absolutely right, but no one is arguing that thinking is unimportant, are they? I’ve never come across anyone – ‘neo-traditionalist’ (whatever that means) or otherwise – who doesn’t agree that thinking is far more important than simply storing an inert stack of ingots in the repository of the mind. No one’s keen on students ‘merely‘ knowing. Remembering is never the point, but it is, as far as I can see, the only reliable means to improve thought. Once someone knows a thing then they should be encouraged to question it. Of course cultural transmission shouldn’t be about inculcating students into believing what their teachers believe; students must consider and critique; they must weigh arguments and form judgements; in short, they must think. But you cannot think about what you don’t know. And this is just the beginning. Once you can think about something, you can then think with it; what we know lives inside us and touches every aspect of our lives. Is differentiation a zero-sum game? 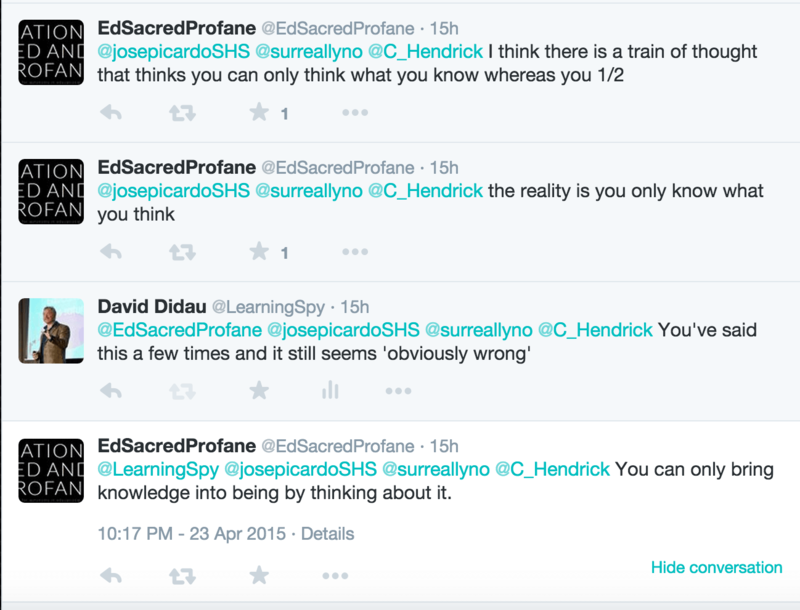 – Words by David Didau The Learning... Whose research is it anyway? 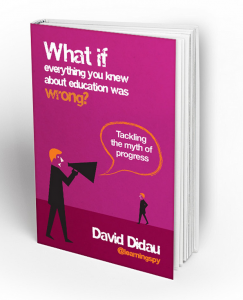 – Words By David Didau The Learning Spy.